North Myrtle Beach Parasailing: Fun Above The Beach! With our sunny weather and extensive beaches, North Myrtle Beach is a favorite vacationing spot for our amazing guests and a great place to enjoy water sports. Combining the amazing views of the beach with the excitement of a high-speed flight, parasailing is one of the coolest activities you can practice in the area and one that the whole family will enjoy. 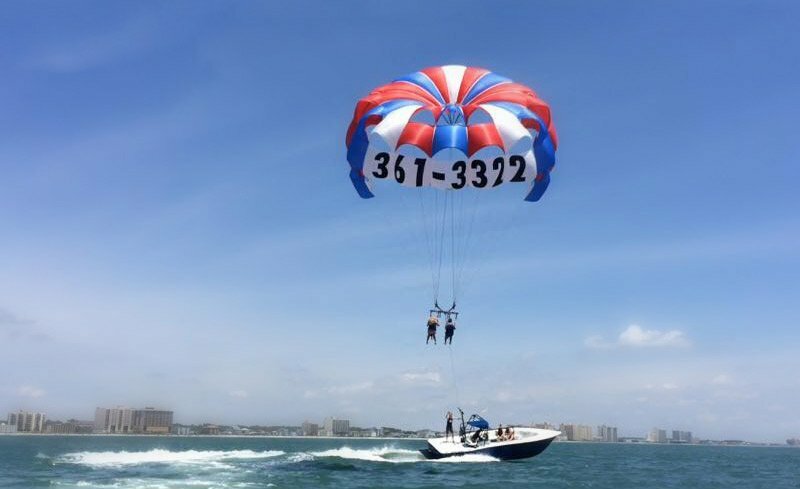 Whether you use your bird’s eye view to spot the dolphins and visitors on the beach, or just enjoy the heart-pounding experience of speeding through the air, these North Myrtle Beach parasailing companies will make your trip one to remember. 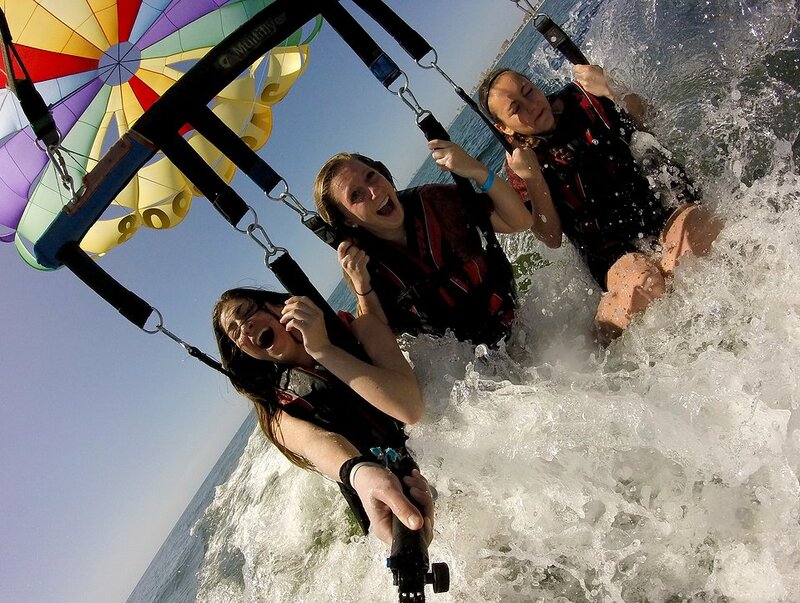 Aloha Watersports specializes in offering fun parasailing tours that everybody in the family can enjoy. Safety is a primary concern for Aloha, which is why their boats are kept in excellent shape and manned by a professional crew with years of experience. Their fleet is composed of Ocean Pro 31 parasailing boats which have been specifically designed to provide a safe, thrilling flight over the clouds. Aloha’s parasailing flights are available for people of all ages and their 2-3 person capacity makes them a perfect way to share an unforgettable experience with your loved ones. But just in case you forget, the company offers professional photo packages which are available for a small extra fee. This parasailing company is a living proof that quality of service and affordable prices can go hand in hand. Each ride starts from the beach, where the riders are taken on a banana boat towards the parasailing vessel at the tune of Bob Marley and UB40 songs. The crew is friendly and extremely competent since Atlantic hires experienced U.S. Coast Guard captains to run their boats. Prices are budget-friendly and are one of the least expensive parasailing tours you can find in the Grand Strand. A 2-person ride costs around $45 per rider and is a great way to enjoy the endless miles of beaches in North Myrtle without breaking your budget. Tours accept riders of all ages and abilities, including people with special disabilities and senior citizens. For an extra $25 you can also take home a memory stick with pictures of your tour. New Wave Watersports has a long history of offering parasailing tours in the area which are fun, budget-friendly, and extremely safe. The excellent condition of their harnesses, parasails, and boats makes for an accident-free record. New Wave’s use of dedicated parasailing boats provides comfortable rides at high speeds for both the riders and the rest of the family aboard. People of all ages are welcomed aboard their parasail boats. Whether it’s small children or frail grandparents, the company has experience dealing with people of all ages between 5 to 90 years old. However, sea conditions are always considered when taking passengers that are very young or very old. Coupons are available on their website and allow you to enjoy discounts on rides and photograph packages. North Myrtle Beach is a wonderful vacationing spot filled with incredible sights of both land and water. Which is why it’s easy to understand why parasailing has become a popular watersport in the area. 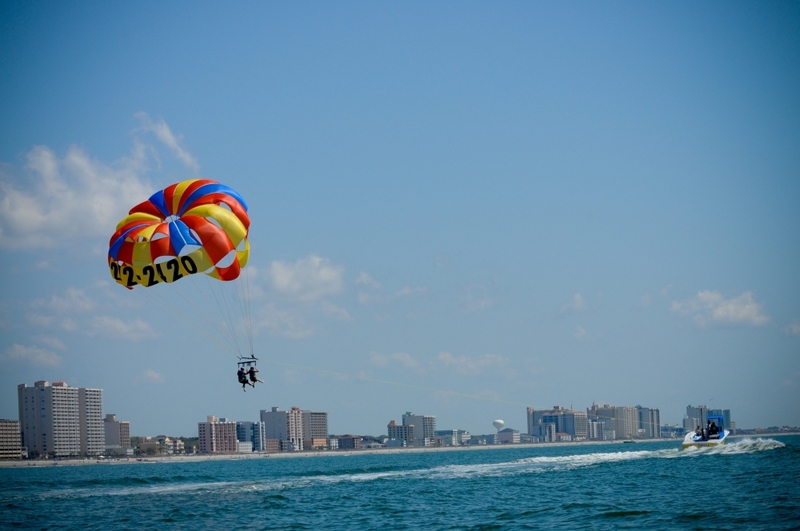 Besides being an exciting high-speed experience, parasailing provides an unmatched opportunity to view all the scenic views of the North Myrtle Beach area from a vantage point high in the sky. Regardless of which tour you chose this will certainly be the height of your vacation!